You can always count on W. 3rd Street to be a destination for dependable yet cool neighborhood restaurants; while the street has definitely become trendier in recent years, many of its best dining spots have managed to stick around, continuing to attract a local following. One of those is Gusto, the intimate Italian joint that just reopened in a brand new location a few blocks away from the original. The new Gusto is bigger, better, and more modern, with a beautiful, airy space and a full beverage program. Though I never had a chance to try the "free-range Italian" cuisine in its first iteration, I was thrilled to check out their new digs and original fare. First off, we were immediately impressed by the lovely space, which nails the concept of modern neighborhood restaurant to a tee. It's airy, contemporary, and spacious, but still warm and inviting. The new cocktail menu is also impressive, with a handful of craft cocktails that all look fun. I ordered the Bella Rosa, which was a fresh combination of Sparkling Rosé, aperol, strawberries, and lemon: a bit sweet, a bit fruity, a bit bitter, and a bit bubbly. The perfect end-of-summer cocktail. Kyle ordered the Equilibrio, which was a fruity and aromatic bourbon offering that he enjoyed. Though their appetizer menu is filled with creative offerings like Crispy Zucchini Blossoms and Crispy Salt Cod Croquettes, we opted for a classic: the meatballs. They were meaty, tender, and came in a rich but acidic tomato sauce that was really tasty. I enjoyed the addition of the creamy ricotta as well. Apparently we were in the mood for classics, because we also got the Margherita Pizza. It was definitely a solid pizza, with a crispy crust that wasn't too thick or thin, and didn't fall apart. A nice smattering of mozzarella and plentiful tomato gave it a nice balance. 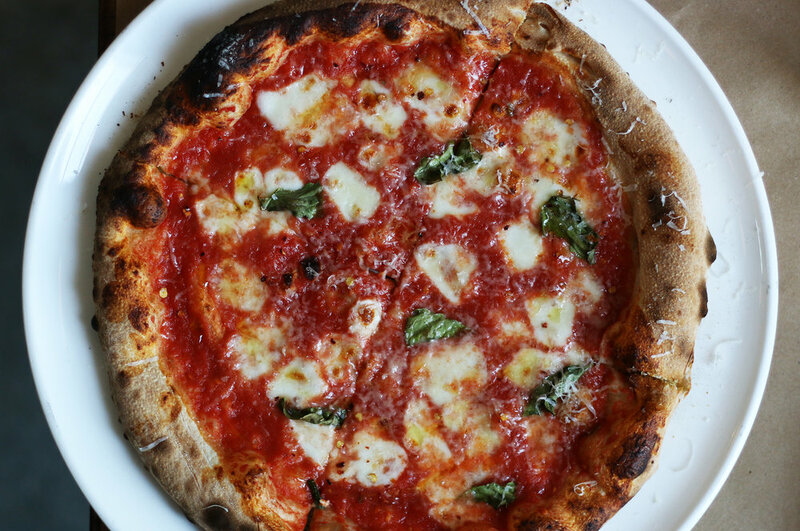 It's as good as any Margherita Pizza you'll find at comparably nice contemporary Italian joints, and you really can't go wrong. The star of the meal was definitely the Bucatini Carbonara, one of Gusto's signature dishes. The bucatini was quite thick and cooked a bit al dente, giving the pasta a bit of chew that contrasted nicely with the creamy sauce and runny egg. Bits of pancetta added a nice meatiness, while the plentiful pepper cut through the richness of the dish a bit. It was definitely a really tasty carbonara, and a super satisfying way to end the meal. Overall, we really enjoyed our meal at Gusto. Is it the most innovative restaurant currently in Los Angeles? No. But it's a really nice neighborhood restaurant with tasty Italian food-- the perfect choice for a low-key date night or an after-work treat. It's definitely a restaurant you can keep coming back to and trying new things, and a fun place to enjoy a cocktail over a pizza.